This chapter discusses the complex decision-making involved in performing a bariatric procedure on the individual patient. 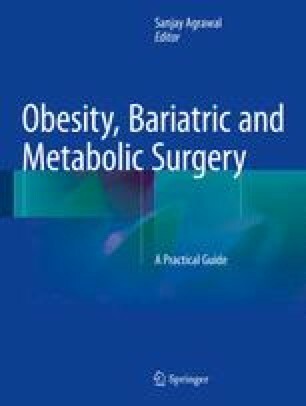 It provides an overview of the benefits and pitfalls of the most commonly performed bariatric surgeries and examines how factors related to the individual patient as well as surgical and regulatory factors affect the selection of the surgery. The authors thank Dr Mervyn Deitel for review and input. National Institute for Health and Clinical Excellence (NICE). Obesity: the prevention, identification, assessment and management of overweight and obesity in adults and children: CG43; 2006. Available online at http://www.nice.org.uk/nicemedia/pdf/CG43NICEGuideline.pdf. Accessed on 27 May 2014. Clinical Commissioning Policy Complex and Specialised Obesity Surgery; NHS England Specialist Commissioning Board. 2013. Available online at http://www.england.nhs.uk/wp-content/uploads/2013/04/a05-p-a.pdf. Accessed on 27 May 2014.